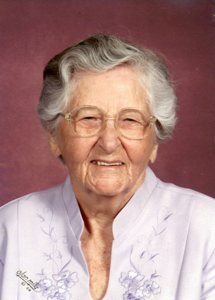 Nancy Clerinda Harbison Wright Daughtry, age 100, of Ethridge, TN passed away Monday, September 17, 2018 at her residence. She was a native of Cullman, AL, a retired beautician, and a member of Ethridge Church of Christ. She was preceded in death by her parents, John David and Sharlet Minina Knight Harbison; her husband, Mike Daughtry; four brothers, David Harbison, Dwight Harbison, Bryon Harbison, and Conrad Harbison; and two sisters, Charlene Perry and Mescal Dewberry. The family would like to thank Unity Hospice, and Lisa and Haley, for all the care they provided. Arrangements are being handled by Neal Funeral Home, 231 N. Military Avenue, Lawrenceburg, Tennessee. The family will receive friends from 1:00 PM to 2:00 PM Wednesday, September 19, 2018 at Neal Funeral Home. Funeral services will be conducted at Neal Funeral Home at 2:00 PM Wednesday, September 19, 2018, with Jacob Evans officiating. Interment will follow at Old Ethridge Cemetery in Ethridge, TN.